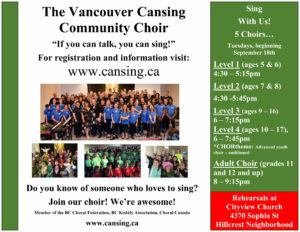 Announcing Vancouver CanSing’s 8th season. Come sing with us! 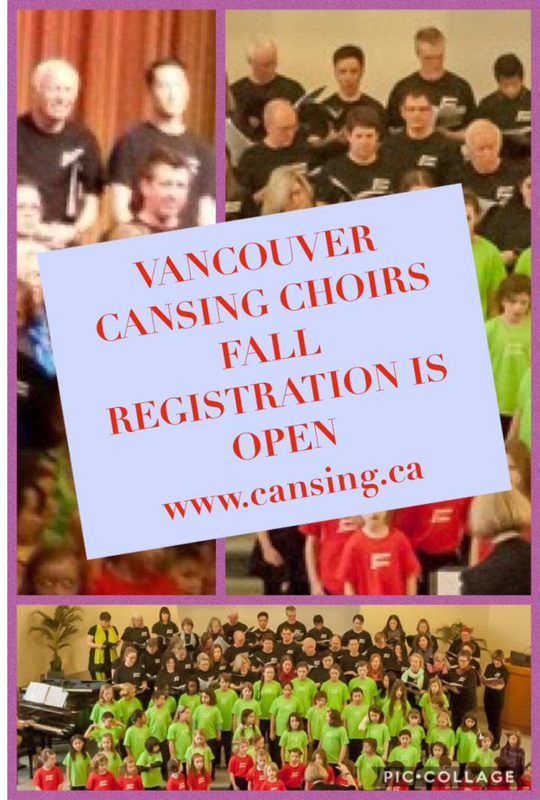 The Vancouver CanSing (VCS) 2017 fall choir session registration is open! 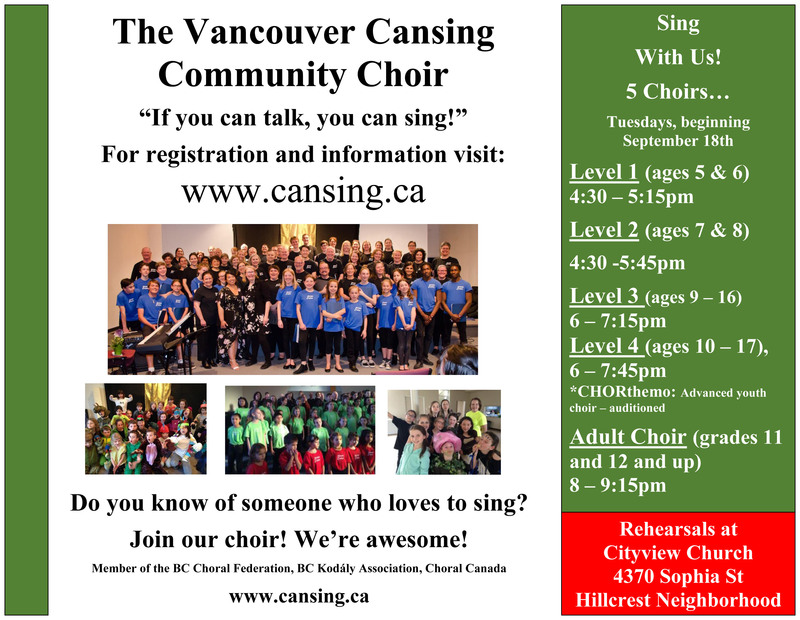 All rehearsals begin Tuesday, September 12th, Cityview Church, the Hillcrest neighbourhood. We welcome new members (youth and adult) who love to sing and perform. Please share via email, Facebook, Twitter, newsletters so the word gets out to people who are keen to sing! 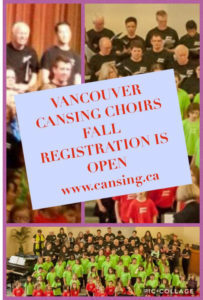 To register, see the choirs below and click for information and instructions. Level 4 CHORthemo (advanced choir) (ages 10 – 17). *New members need to audition for this advanced choir (see information on website). 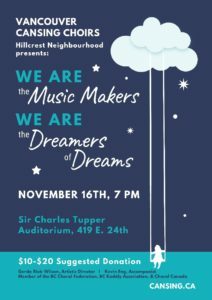 The choirs will be rehearsing for the 70 – minute show, TO THE SPIRIT OF SONG, Friday, November 17th, 7pm and will feature thematic songs from the classic, jazz, popular, musical theatre and folk genre. While many pieces are still being selected, the show will feature some fantastic mass choir selections including Changes (women’s choirs), Stand by Me (men) Bonse Aba (Adult & Chorthemo) Sing (Advanced youth choir) & Kusimama (Mass Youth choirs). The VCS mass choir of 150 voice will perform I Love You/What a Wonderful World. A more detailed list of music repertoire will be sent to registrants at the end of June. 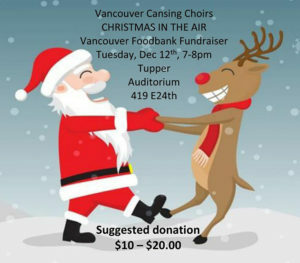 Vancouver CanSing choirs are pleased to announce that Kevin Eng will be our new accompanist. He has already begun rehearsals with Level 2 & 3 in preparation for the CLOWNS musical, June 7, 2:30 and 7pm Cityview Church. Kevin brings a lot of experience and enthusiasm and will no doubt help build our Hillcrest neighbourhood community choir both in a musically proficient way but also in a positive and friendly atmosphere. 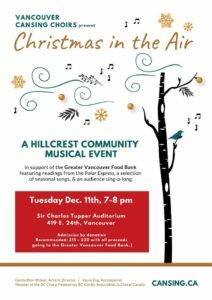 As you all know, Erica Ross, our assistant conductor/accompanist, has been instrumental in building the Vancouver CanSing Choir program in the Hillcrest neighbourhood. Her friendly, encouraging and very accomplished manner in both rehearsal and concert has enriched our practices and performances. Erica will be leaving Vancouver soon after our March 8th concerts. She will be greatly missed!! So, the search will begin for a new accompanist for some work through April – June with Level 2 & 3 and most importantly for the 2014-15 Season. We are seeking a team player, interested in working with and building our choirs in a friendly but musically proficient way. Interested candidates should have completed a minimum of Grade 10 Royal Conservatory of Music or its equivalent. Good sight reading of the music is important. Choral accompanist experience is an asset. Remuneration is competitive. If you happen to know of someone who might be interested in this opportunity, please have them email me: gwilson@cansing.ca for details.